Given an Undirected simple graph, We need to find how many triangles it can have. For example below graph have 2 triangles in it. Let A be adjacency matrix representation of graph. 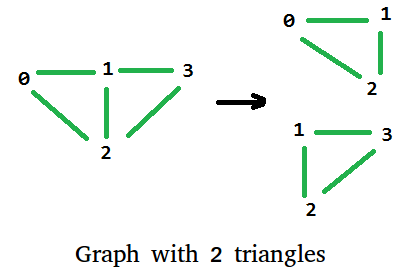 If we calculate A3, then the number of triangle in Undirected Graph is equal to trace(A3) / 6. Where trace(A) is the sum of the elements on the main diagonal of matrix A. Below is implementation of above formula. If we compute An for an adjacency matrix representation of graph, then a value An[i][j] represents number of distinct walks between vertex i to j in graph. In A3, we get all distinct paths of length 3 between every pair of vertices. A triangle is a cyclic path of length three, i.e. begins and ends at same vertex. So A3[i][i] represents a triangle beginning and ending with vertex i. Since a triangle has three vertices and it is counted for every vertex, we need to divide result by 3. Furthermore, since the graph is undirected, every triangle twice as i-p-q-j and i-q-p-j, so we divide by 2 also. Therefore, number of triangles is trace(A3) / 6. The time complexity of above algorithm is O(V3) where V is number of vertices in the graph, we can improve the performance to O(V2.8074) using Strassen’s matrix multiplication algorithm.